Throughout the storied history of the area, the island�s beautiful beaches have served as a peaceful getaway for Charlestonians and other residents of the Carolinas. However, few people lived there full-time until the late 1800s. Even after the automobile became the main mode of transportation for Americans, travel to the island was difficult until the Isle of Palms Connector opened in 1993. Today, the trip along the two-mile-long road that links the island community to bustling Mount Pleasant is no problem. The Isle of Palms Parks and Recreation Department offers numerous activities for residents and tourists, from aerobics and yoga to recreational team sports, and there�s a full-service marina for boaters. On the north end of the island, the spectacular Wild Dunes Resort is home to two world-class championship golf courses. Both The Links and The Harbor Course were designed by renowned architect Tom Fazio. The island is within minutes of the Charleston area�s many historical attractions, including the downtown district; Fort Sumter, where the Civil War began; and Fort Moultrie on Sullivan�s Island, the scene of one of the first battles of the American Revolution and where author Edgar Allan Poe served during his stint in the Army. 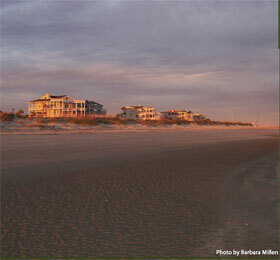 Isle of Palms residents are a short drive from the most complete shopping center in the area. Towne Centre, in Mount Pleasant, was designed to look like a small Southern village and features national department stores and shops as well as locally owned businesses. Also nearby is Shem Creek, home to one of the area�s last fishing boat fleets, unusual art galleries and several outstanding restaurants.